Today I am not posting any recipes in my blog. Instead I thought it would be interesting to share with you all on "how did I organize oils" in my kitchen. When it comes to kitchen organization, remember that functional and clutter-free kitchen is always easy to handle, time-saving and mess free too. I will show you all the little tips and tricks you will need to get your kitchen back on track and clutter free. I use ever silver containers to store oils. 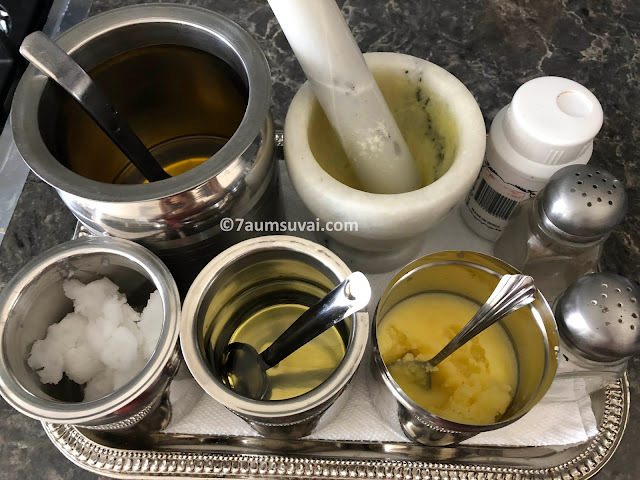 Also I use an ever silver tray and a tissue paper to place the oil containers. 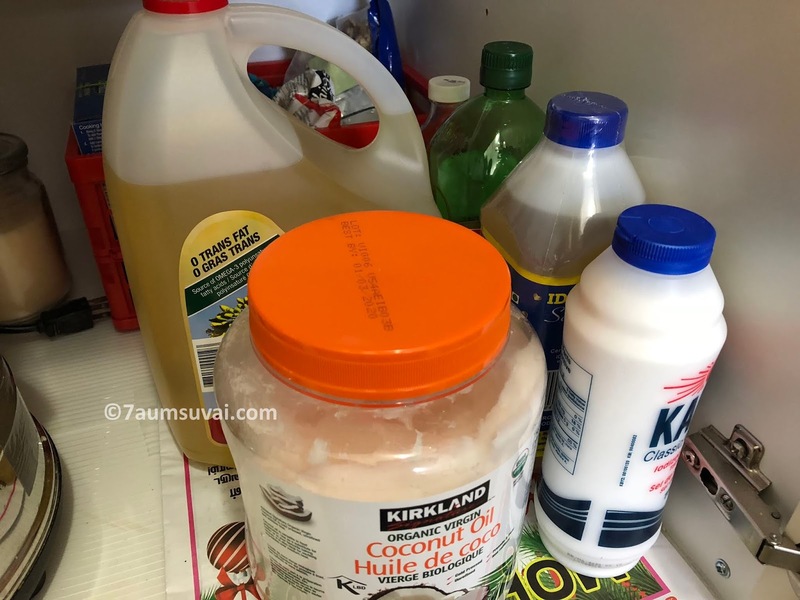 Regularly used oils are kept closer to the stove for easy access. The rest are stored under the lower kitchen cabinet, which are also placed with plastic self liners along with tissue papers/ news paper on top. Starting from the right I have ghee, canola oil, coconut oil and from left most top I have sesame oil, a mortar and pestle, asafoetida,salt and pepper powder on sides. 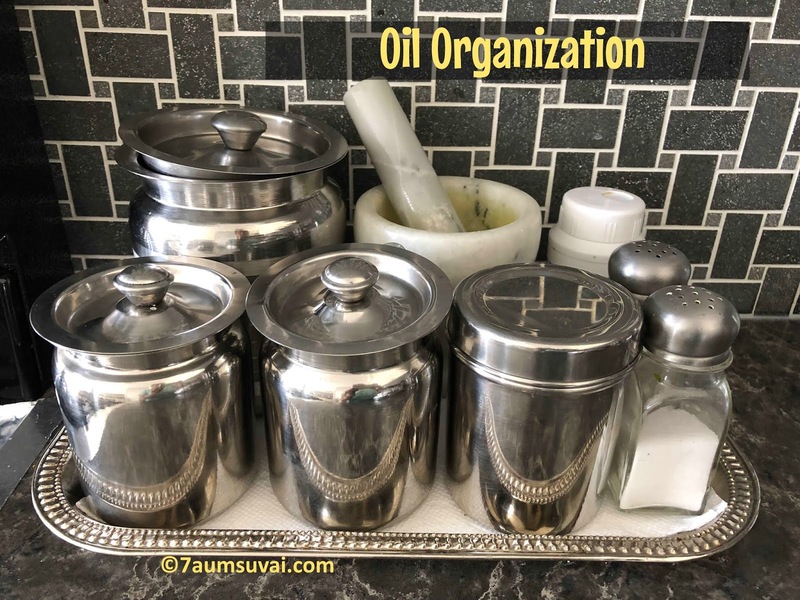 Always try to use ever silver or glass containers to store oil. Obviously no plastics as you all know the reason behind it. Ever silver containers are easy to handle and absolutely break free. Where as glass containers are more slippery and break easily. Always try to use liners to store oil containers. Use an ever silver tray or plastic tray and line it with a tissue paper or news paper for easy use. Whenever oil spills while cooking, you may simply change the tissue paper or news paper instead of washing the whole tray. Store oil containers next to your stove for easy access. Functionality in the kitchen is always very important for a clutter free and a mess free kitchen.